During public comment at the Wednesday, November 14 meeting of the Elk Grove City Council, the ongoing issue of switching to a by-district system for elections and representation resurfaced. The issue was broached during the public comment. Speaking to the council, Elk Grove resident Amar Shergill briefed the council members on recent activities of Keven Shenkman, a Malibu-based attorney who has successfully persuaded or sued several California municipalities forcing a conversion to by-district form at-large elections. Last spring Shenkman sent a letter to the city saying it will sue the city if it does not voluntarily switch to the more democratic, less discriminatory by-district system. In his comments, Shergill noted that in the last several months, Shenkman has succeeded in convincing several communities to become by-district. "Today I ask you again, to save the city of Elk Grove millions of dollars," Shergill said. "As you may be aware, the city of Santa Monica was sued by a non-profit and Kevin Shenkman, the same attorney who has put the city of Elk Grove on notice for racial discrimination under the California voters rights act." 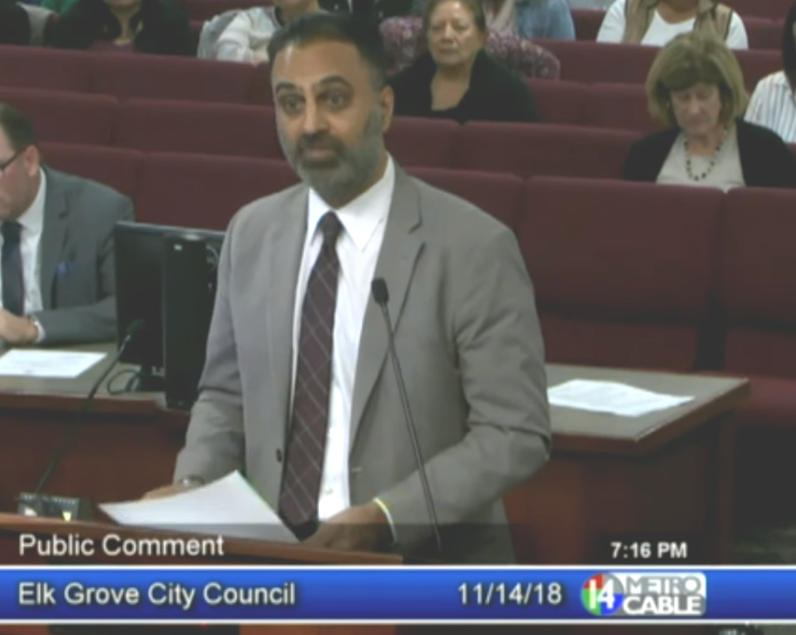 Shergill added that Santa Monica lost that lawsuit, and it will cost taxpayers there, according to Shergill, $5 to $10 million (see video below). In by-district elections, representatives are elected by voters in a geographically defined area while Elk Grove's at-large format has council member from a defined district voted on by the entire city. Shergill argued as others have in several successful lawsuits that at-large is discriminatory and in violation of the Califonia Voters Rights Act (CVRC). In addition to the Santa Monica ruling, Shenkman has scored other legal victories in pursuit of cities found to be violating the CVRA. With each of those victories, municipalities have been ordered to pay Shenkman's legal fees which have amounted to millions of dollars. n 2013 Palmdale spend $7 million unsuccessfully defending its CVRA lawsuit and was ordered to pay Shenkman $4.7 million for his legal fees. Along with Santa Monica, Shenkman's team last week convinced the City of Buellton to voluntarily switch to by-district, thereby saving taxpayers litigation costs. Other cities that have decided to voluntarily comply with CVRA request from Shenkman have included Martinez, Redwood City as well as at least two Bay Area school districts. With the exception of Elk Grove Mayor Steve Ly, the four other city council members, Steve Detrick, Pat Hume, Stephanie Nguyen, and Darren Suen have vigorously defended maintenance of the current at-large system. Critics have noted the four council members benefit from the current system that makes it financially more difficult for a non-incumbent to raise the required $100,000 to stage a citywide campaign. In his finishing comments, Shergill added "it is a breach of trust for you to use the Elk taxpayers' money to spend millions on a discriminatory voting system that benefits you personally. No Comment to " Voter discrimination issue resurfaces, Elk Grove urged to avoid taxpayers burden and voluntarily change to by-district "